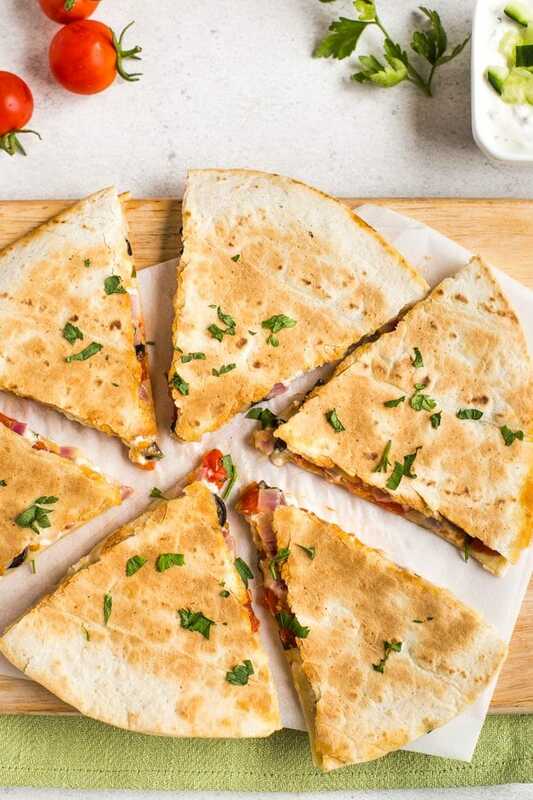 A quick and easy lunch option - Greek quesadillas, filled with black olives, tomatoes, feta cheese, and lots more! These Greek quesadillas are a quick and easy lunch option inspired by my favourite classic Greek salad! With feta cheese, olives and tomato (plus more! ), they’re absolutely full of flavour. 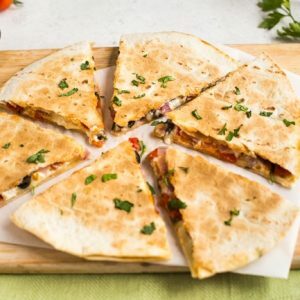 Quesadillas are one of my go-to lunches – they’re quick and easy to make, and can be adapted however you like to suit your mood. My mood is almost always ‘just plain lazy’, so a lunch that takes 10 minutes (max!) to make is perfect. 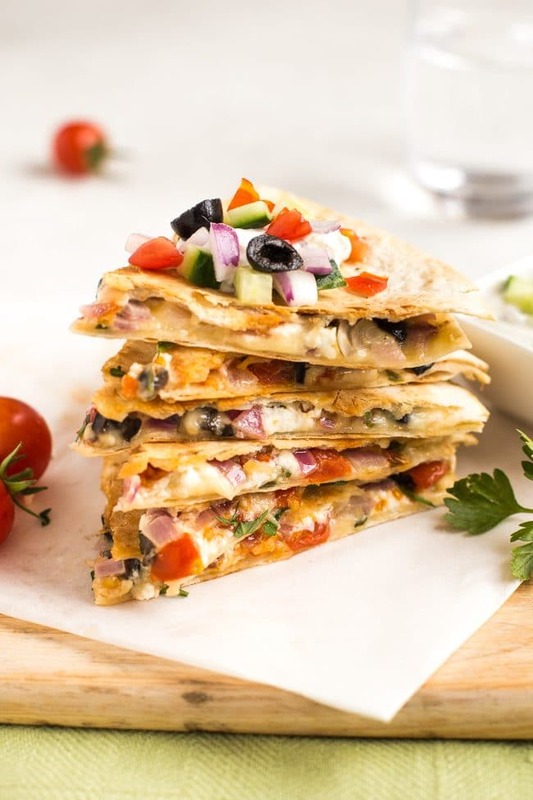 These Greek quesadillas are inspired by my favourite Greek salad, with plenty of tasty bits! I’m not much of a salad lover, but a classic Greek salad is one of the few salads that can really tempt me. I even sometimes order it from my local Greek take away – I order salad! From a take away! When I could be ordering chips! That’s how good it is (though I do sometimes get the chips on the side). Rather than being full of leaves like some salads, Greek salad is made with all sorts of tasty ingredients – juicy tomatoes and cucumber, red onion, black olives, salty feta cheese, fresh parsley… all killer, no filler. Of course, quesadillas are a Mexican dish, but I’m a big fan of fusion food, and if I can eat two of my favourite cuisines in one meal, I’m all for it! Quesadillas take literally 10 minutes to make, so they’re a great option even on the busiest of days. Just stick a large flour tortilla in a frying pan, add your fillings, and sandwich another tortilla on top. You need to cook quesadillas over a fairly low heat so that the cheese inside has a chance to melt before the outside gets overly browned. Leave it for a few minutes, flip it over, then cook the other side. As well as the feta cheese, I added a bit of grated cheddar to my Greek quesadillas. It’s not particularly Greek, but as it melts, it helps to stick everything together – otherwise they can be a bit difficult to flip! You can skip the cheddar if you like, but beware that it might end up looking a bit of a mess after you’ve turned it over. I make quesadillas often, and I don’t think I’ve ever used the same combination of fillings twice – they’re a great way to use up any bits and pieces from the fridge that would otherwise go to waste. I like to make a good fridge clearing recipe every week or so to use everything up (it feels so good to start afresh with an empty fridge! 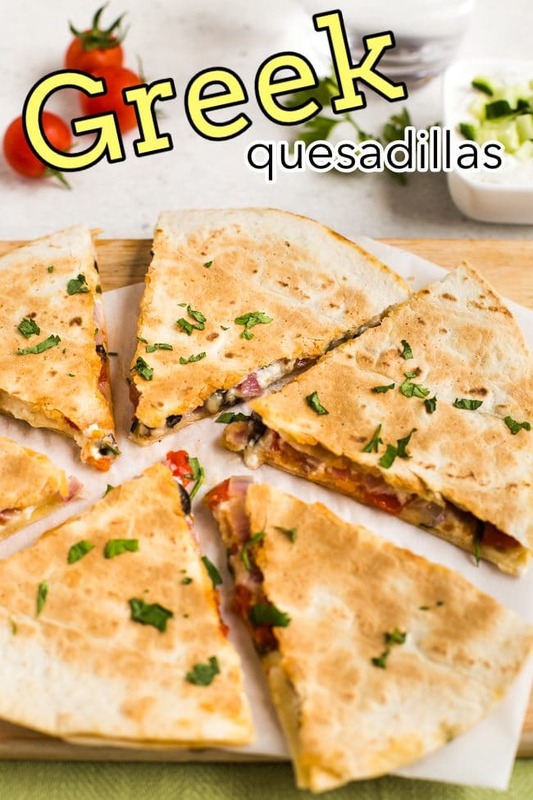 ), and if you’re sick of frittatas, stews, soup, or whatever else you usually use as your go-to fridge clearer, quesadillas are a great option! …or whatever else you fancy! I like to serve some kind of sauce or dip on the side of my quesadillas – something that fits the theme of your fillings. This time, I served a big dollop of tzatziki on the side of my Greek quesadillas. The perfect fusion lunch! 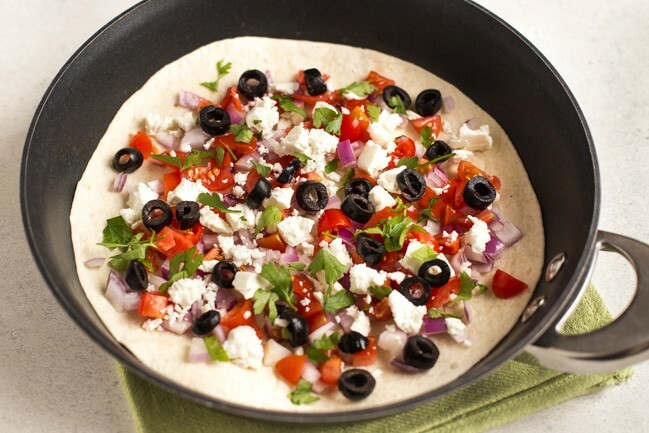 Place a flour tortilla in a large frying pan, and add the chopped onion, tomatoes, feta, olives, and parsley. Sprinkle over the grated cheddar, and top with the second tortilla. Press down gently to compact the quesadilla slightly. Place the pan over a medium heat, and cook for a few minutes, until the underside is golden brown, and the cheese inside is starting to melt. Carefully turn the quesadilla over (either using a large, flat spatula, or by turning it out onto a plate, and then sliding it back into the pan). Cook the other side for a few minutes until crispy. 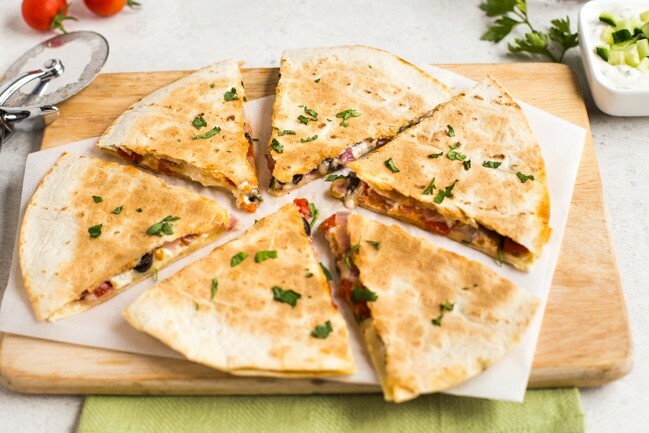 Slide the quesadilla onto a board, and cut into slices with a pizza cutter. Serve your Greek quesadillas with a dollop of tzatziki, if desired. Note: Nutritional information is approximate, and will depend on exactly what ingredients you choose. Information above is for 1/2 the recipe, not including tzatziki. 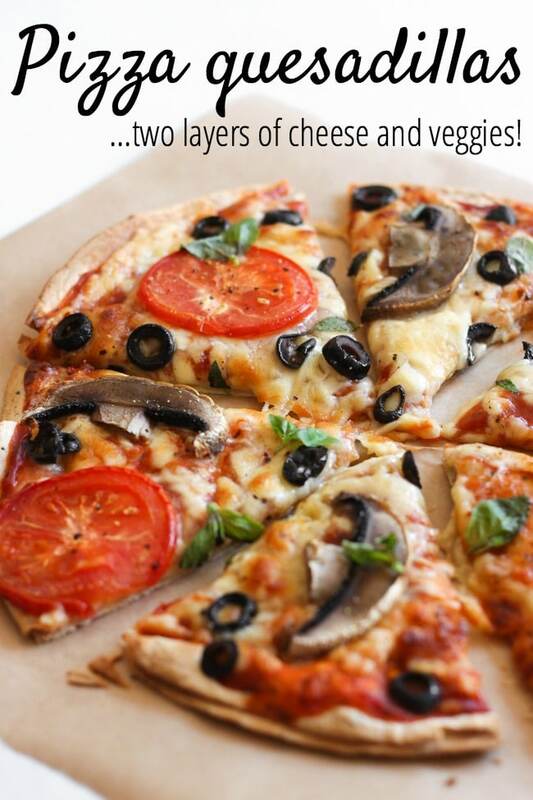 You should also try my pizza quesadillas, with two layers of cheese and veggies! Don’t know why I hadn’t thought of this before! Feta + quesadillas. What’s not to love? I’d probably add some spinach. Thanks so much for spending a moment on my blog. I wish I could take credit for the Butternut Mac and Cheese, but I have to give it to Lindsay from Tasty Kitchen! It’s now my FAVORTIE PASTA EVER. No lies. This looks delicious! I love all the ingredients you’ve used and to put them together is just genius! I love mixing flavours from both the East and West!